In the beginning, racing was just a hobby for John Klausmeier, crew chief for the No. 10 Smithfield team and driver Aric Almirola at Stewart-Haas Racing (SHR). That all changed in 2002 after Klausmeier landed an internship at Dale Earnhardt, Inc. while completing his degree in mechanical engineering at the University of Maryland-Baltimore. With a Bachelor of Science degree in hand, Klausmeier moved to North Carolina to pursue a career in racing. He had turned his hobby into a full-time job. 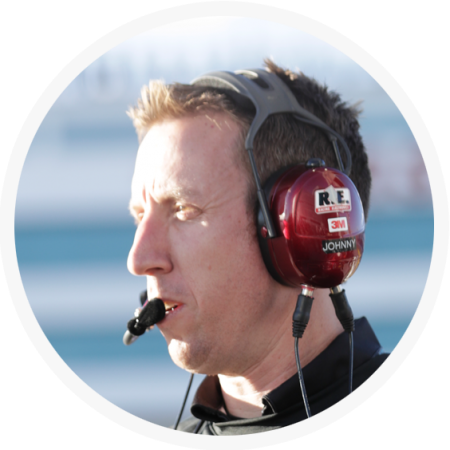 Klausmeier began his tenure with the Earnhardt team in 2005 as an aerodynamics engineer and then transitioned to test engineer, collaborating with drivers Dale Earnhardt Jr., and Martin Truex Jr., at numerous test sessions on racetracks throughout the United States. Klausmeier became a race engineer in 2007, working with the No. 15 Monster Energy NASCAR Cup Series team of driver Paul Menard before joining SHR in 2009. As a race engineer at SHR, Klausmeier worked with drivers Ryan Newman, Danica Patrick and Kurt Busch. From SHR’s inception in 2009 through the end of 2018, those drivers scored eight wins along with 55 top-five finishes and 143 top-10s. Two of those victories, in particular, stand out for Klausmeier. Busch’s victory at Pocono (Pa.) Raceway in June 2016 came with Klausmeier as his interim crew chief in place of Tony Gibson. And Klausmeier was a part of Busch’s biggest win – the 2017 Daytona 500. Klausmeier’s accomplishments as an engineer and interim crew chief led to his promotion as the full-time crew chief for Almirola and the No. 10 Smithfield team in 2018. WithKlausmeier calling the shots, Almirola ended 2018 a career-best fifth in the championship standings, 11 places better than his previous best points finish of 16thin 2014. He got there thanks to front-running consistency. Almirola’s 17 top-10 finishes were more than double his tally from any previous season, and his 181 laps led were more than he had in his seven previous seasons combined. Finally, after contending for wins all year long, Almirola finally broke through in the fall with a popular victory Oct. 14 at Talladega (Ala.) Superspeedway that sent him into the penultimate round of the NASCAR Playoffs. Klausmeier’s run with Almirola at the helm of the No. 10 team was not his first with the driver. The duo first met in late summer of 2007 when Almirola began testing and competing for the Earnhardt team. Klausmeier resides in Mooresville, North Carolina, with his wife Brooke and their son Cam and daughter Olivia.